“In 1887 , on an expanse of farmland and forested hills dotted with private homes , a brewing company was founded that specialized in German brewing methods. Three years later a beer was born. The name of the beer later became the name of the train station and the name of the town. 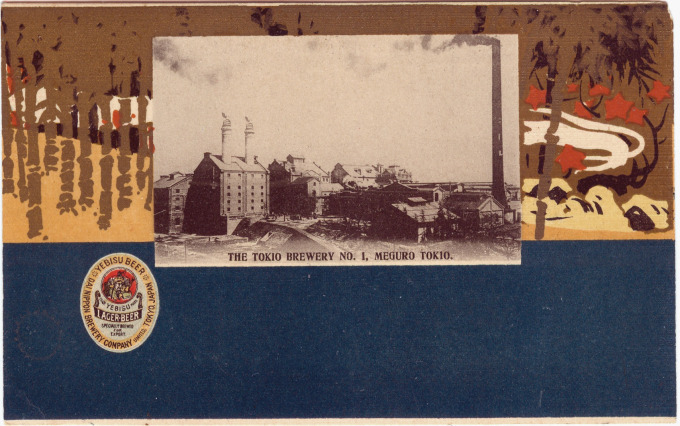 That beer was Yebisu Beer.” – Museum of Yebisu Beer, Sapporo Breweries Ltd.
“[Nippon Beer president] Magoshi’s marketing strategies were simple but innovative, and he took a variety of approaches to reach new beer consumers. “First, whenever his firm delivered the first shipment of the year to any city or town, his deliverymen would ride in aboard horse-drawn wagons, sporting tradition happi coats emblazoned with the company’s logo … Significantly, he claimed that Japan’s emerging beer consumers could be divided into four key groups: geisha, actors (yakusha), scholars (gakusha), and doctors (isha). Magoshi believed that by earning the endorsement of geisha and actors, he could earn wider recognition through word of mouth (kuchikomi); through acceptance by scholars he could earn added prestige; and through sales to doctors he hoped to receive publicity that beer was good for health (kenko ni yoi biiru). On February 25th 1890, one of the first and most iconic of Japanese brews, Yebisu Beer, was born. Brewed by the Japan Beer Brewery Company [Nippon Biiru], predecessor to the Sapporo Brewery and produced in the midst of the rapid modernization Japan underwent after the Meiji Constitution was introduced, Yebisu was a high quality beer brewed with traditional German methods. It proved so popular that the neighborhood it was brewed in, Mita (in Meguro Ward), was renamed ‘Ebisu’ in its honor. Competition between the Sapporo and Japan Beer companies, as well as competition with the Osaka (now Asahi) and Kirin breweries led to a 1906 merger of Sapporo, Japan, and Osaka breweries into the Dai-Nippon Beer Company, Ltd., which formed a near monopoly on the Japanese beer market until after World War II. After 1949, Dai-Nippon was split into Nippon and Asahi breweries, with the Nippon Breweries resuming production of Sapporo beer in 1956 and renaming itself to the present name, Sapporo Breweries, in 1964. Yebisu Beer was relaunched as a separate brand in 1971, marketed as a German-style barley beer.